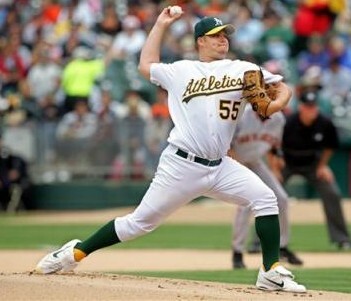 According to our good friends at Phillies Nation, the Philadelphia Phillies have acquired right-hander Joe Blanton from Oakland for three minor leaguers not named Carrasco or Golson. Comments are pretty down on this, as a lot of Phils fans liked Josh Outman (which is the coolest pitcher name ever) and Adrian Cardenas, and they, along with Matt Spencer, were sent to the Bay Area. Blanton is under the Phils control until 2010, so I like this move because of that. He's a fourth starter, and this probably signifies the end of Adam Eaton in the starting rotation (I hope). Buster Olney reported this morning that if this deal got done it could happen quickly, and I have to say he was right on.